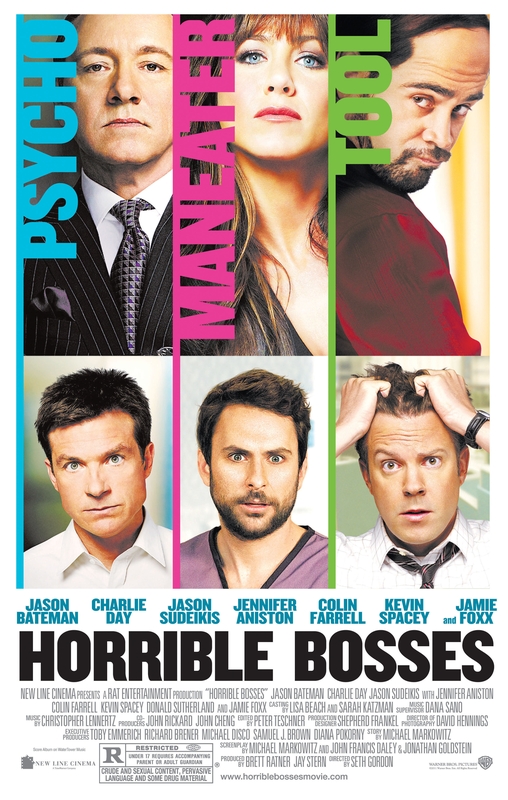 You asked for them, so here they are – advance screening passes to see one of the funniest-looking comedies of the year, Horrible Bosses, on Tuesday, July 5 at 7PM in Salt Lake City. Because Horrible Bosses is rated R for crude and sexual content, pervasive language and some drug material and nobody under the age of 17 will be admitted, the system for giving out these passes will be a little different than usual – somewhat like one of our DVD giveaways, only we have a lot more passes to give out than we do DVDs. Follow these simple instructions. I promise it will be easy and totally worth it. 1. Write a one-paragraph story about a “horrible boss” you work(ed) for. Please do not mention business names. 2. Post that single paragraph story in the comments below. of the text simply type your name, age and paste your horrible boss story. All submissions received by participants 17 or older will be winners until the Gofobo tickets are depleted. I will reply to emails with the Gofobo RSVP code to those participants ages 17 or older. If more tickets become available, I will send the code to those who submitted their stories the earliest. Please remember that no one under the age of 17 will be admitted. No matter what your age is, be sure to bring your ID to the screening. Securitywill be checking IDs and denying entry to those who either do not have IDs or are not at least 17 years old.